Old US 106 is now designated as PA hwy. 706; its terminus at US 6 is at the same location as the historic western terminus of US 106. That was heading east on NY hwy. 52 in Narrowsburg. Just behind the camera, at the PA/NY state line (which is formed by the channel of the Delaware River), PA hwy. 652 (old US 106) becomes NY hwy. 52. 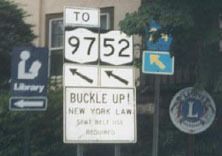 Upon landing on the NY shore, drivers are in downtown Narrowsburg, and there is a fork in the road: to the right is Main Street, while NY 52 is routed left towards NY 97. US 106 may have ended at that fork.